The best way to start is by grabbing a program and a quick relax in your comfy room. Trust, it may be the only rest you get once the ship starts reggae rockin! Sun sets and it’s time for the first bashment. No bougie vibes for our girl, please! Shorts and heels, what better to wear as you prepare to rock out and bruk out ’til you tap out. Jamrock is the perfect opportunity to get up close to a plethora of legendary artists in a single week. Mr Vegas electrified the audience, blazing through his vast catalogue of dancehall anthems. Basking… Sometimes you need to take it all in to realize, you’re finally here, at Jamrock. Jamrock is not entirely about the party. The ship docks at Ocho Rios and Falmouth, and you cannot miss the island sights. St. Mary is in the northeast of Jamaica and although it is one of the smaller parishes, it embodies the Jamaican saying ‘likkle buh tallawah.” From James Bond creator Ian Fleming calling it home in the 1940’s, to its capital, Port Maria, being the site of one of the island’s bloodiest rebellions in 1760, there’s a lot of history to explore. “Style a Style, some bwoy cyah ketch it.” Crochet wear is perfect for the Caribbean weather. Long ago, the techniques were passed down from generation to generation and, though, commercially, machines have taken over, ask some of the older women you meet along the way, you’ll hear stories of sitting down with pieces of thread and needles learning at a grandmother’s feet. Who visits Jamaica and doesn’t head for some healing river wata? OCHO RIOS! Tourists go to Dunn’s River Falls, which was famously featured in the James Bond film, Dr. No. 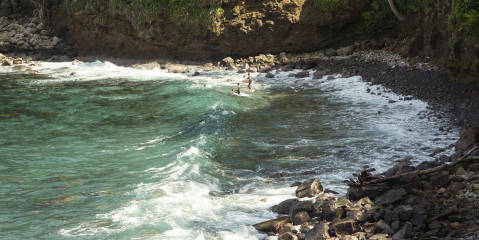 Jamrockers go to the real Jamaican spot, Little Dunn’s River Falls, and soak up where the sea and the rivers become one. What do models do when they get a great photographer and a great backdrop? Pose! Rochel takes a quick picture with a couple of the Jamrock cruise organizers: John and Tanya are part of the artist and media management teams and put in a great deal of work to make it all possible. Back on the ship to head over to the Sky Pad. All that pent-up energy is still jumping around. Thank God, there’s bungee jumping on deck to let it out. Evening cooldowns are just different in Jamaica, especially when you’re rolling with Jamrock. Trainers and water slides: What else could a girl want? An on-deck track? With all-you-can-eat buffets on this cruise, it makes a lot of sense. JA meets Italy as Rochel gears up to make a splash in her Ellesse bathing suit, at Burwood Beach in Falmouth. Amazing ocean dip, check! Now what else could you possibly want? Your very own “Bond girl exits the water” pic, maybe? The crop top’s been a Jamaican specialty since Dancehall Queen Carlene. Rockin’ a vintage crop in the Jamaican sun is all a girl needs to make the vibe (and photo) lit! Yard vibes…. What you looking at? Konjo means ‘Beautiful’ in Amharic, the language of Ethiopia. A Konjo crochet top and tam by designer Makeddah T is a perfect look for the island that is the birthplace of Rastafari. Konjo crochet designs are one-of-a-kind. Just like the Jamaican sunsets. Now where’s that rum cocktail? Tony Matterhorn destroys the sound clash and wins by popular vote! Hands in the air! The crowd roars their approval for Matterhorn. Back in Miami. Is it time for Jamrock 2019 yet?